Russia’s elite security service, the FSB, has reportedly smashed an “undercover jihadist cell” allegedly gathering cash to fund terror attacks. Footage three suspects being detained after elite special forces raided a number of addresses at different locations. The three men, who are so far unnamed, were taken into custody and reportedly ‘confessed’ to running a ‘charity organisation’ as a front to raise funds for terrorists. According to reports, the men were acting on orders from the Islamic State in Syria. The FSB met with no resistance when gun-toting officers raided homes linked to the alleged cell. 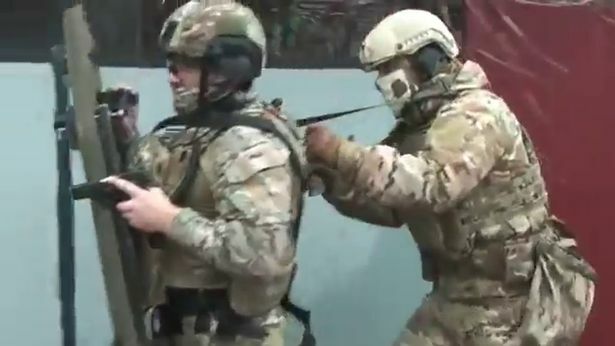 “The Federal Security Service shut down the activity of an undercover cell in the Krasnodar, Dagestan and Adygea regions, which was operated from Syria,” said a statement from the counterintelligence agency. The cell had been “gathering and transferring funds for the international terrorist organisation Islamic State, which is outlawed in the Russian Federation”. Its members “transferred funds as a charity organisation for supporting their contacts in the Syrian Arab Republic”. Evidence that around £120,000 had been raised in Russia and transferred to Syria was found in documents on on computer files, said the FSB. The three suspects have been charged under Russia’s anti-terrorism laws. “They made confessions during questioning,” said an FSB source.